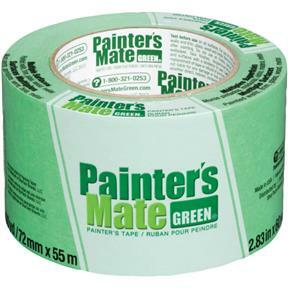 Professional grade, multi-surface painter's tape for interior use on painted walls, woodwork, glass, metal and vinyl. CP 150 Painter's Mate Green® brand painter's tape is a medium adhesion masking solution that removes cleanly for up to eight days - even in direct sunlight - and delivers professional paint results at an exceptional value. 2-3/4" wide by 60 yd.